Seeing spiders in your home can be very alarming and terrifying for some people. 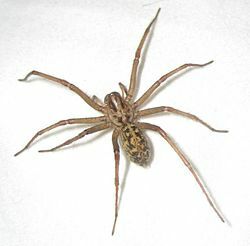 The Hobo Spider is the most common poisonous spider that we have in the NW (mainly the Portland Or and Vancouver Wa areas). They are on the larger side, brown, with a V-shape on its abdomen. If you see a spider that resembles this, don’t freak out! Is This A Hobo Spider? Hobo spiders bare a striking resemblance to the Giant House Spider, which is non-venomous and is actually good to have in your home. The Giant House Spider (though it sounds and looks menacing) have been known to actually eat Hobo Spiders. When it comes to where the Hobo Spider and GHS (Giant House Spider) want to live, they have the same tastes in location and food. Since the GHS is much larger when full grown, it wins that battle. At a glance, it’s nearly impossible to tell the difference without a trained eye. The GHS has markings on their legs and the Hobo Spider does not. Brown Recluses have 6 eyes are that are paired in twos, the Hobo has 8 eyes that are clustered together. Source: Hobo Spider. (2014, March 26). The Hobo Spider’s web is shaped a lot like a funnel and when it catches its prey, it likes to take it to the deepest, narrowest part of the funnel to feast. They belong to the Agelenidae family, mainly due to their funnel webs. Not only do they live in their webs and eat there, they also use them as mating grounds. When the season comes, the males will venture out to find the lady Hobo of his dreams. After they mate at her web, he either dies or moves on to the next one (which sounds bad, because it kind of is). A females body can range from 11mm to 14mm in size. Their legs have no markings and are a solid color. They also have a larger abdomen than their male counterparts. The male has swollen appendages that are seemingly quite sinister, but don’t let them fool you, they’re only meant for holding their reproductive organs. We said they are poisonous and then didn’t go further, we’re sorry. The Hobo Spider, like other spiders, usually won’t bite you for no reason. They tend to only attack when they feel threatened or their egg sac is threatened. To learn more about the symptoms associated with a Hobo Spider bite, click here.